In July 2010, CBS news ran a segment entitled, “When Granny Becomes Nanny.” In this report, a survey of 10,000 grandparents revealed that 61% of them take care of their grandchildren on a regular basis. This goes above and beyond hosting sleepovers, visiting the kids on the weekends, helping out when a new baby is born, sharing special venues and spending time together into a lifestyle where the grandparents become responsible for the day-to-day care of the grandchildren. Are parents taking advantage of the grandparents? Grandparents have already filled their parental shoes by raising their own children. It seems that the circle of life should allow them to sit back and enjoy their grandchildren, spoiling them and spending time with them out of sheer pleasure rather than necessity. And while most grandparents don’t mind watching the grandkids for a weekend, helping in an emergency or so mom and dad can have some time away – is it fair to expect them to do so on a continual basis? Often, it seems that the minute an adult child calls the grandparent; the grandparent drops whatever they are doing or cancels whatever plans they have, to babysit. They are often “on call” which makes it difficult to have a life of their own. In other situations, they are full-time babysitters while the parents work. M-F from 8-5. Often two or more grandchildren, five days a week and sometimes even more babysitting on the weekends. After years of parenting themselves and often working – these grandparents are now required to have a new full time job as a babysitter. The grandparent is now older, with often less energy and stamina than 30 years ago. Chasing a toddler around a room or trying to get three children ready for school – can be exhausting. 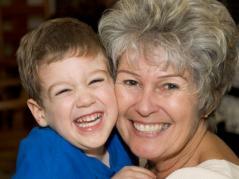 Of course, the benefits of grandparents as caretakers are immense to the family. The childcare is better – the kids are in a place where they are loved and nurtured. And the parents are able to work outside of the home. Additionally, when your kids are with the grandparents you can escape away for a weekend without worrying about how they are being taken of, and if they are okay. The problem of course becomes a problem, when the grandparents are taken advantage of. The golden years of grandparenting are something that most people look forward to. They have children that they can dote on without constantly feeling that they have to parent and discipline. If children are with the grandparents so often that discipline is always necessary on their part – this can create unhealthy role issues. The grandparents want to be grandparents, not parents to their grandchildren. It is also important to consider the grandparents schedule. Sure, they would like nothing more in the world than spending time with their grandchildren. But, it isn’t fair, or nice to simply always assume that they would rather watch the kids. Without setting boundaries with adult children early in the game, parents run the risk of well-meaning intentions turning into a dreadful hem-and-haw every time they are asked — again — if they would mind watching the kids. Sometimes, it all works out. Case in point: Joan Seegrave, grandmother of four, says she rarely says no to sitting requests. “I’ve been available and willing. And, I’ve enjoyed every minute of it,” she says. This is not always the case. A lack of granny-nanny guidelines can also lead to sticky situations. Two days later, the phone started ringing again. Then, more phone calls. Babysitting requests started piling up. One way to avoid getting stuck in this predicament is for the grandparent to outline for the adult children how much free time they have for babysitting. Even lightly strike up the conversation before the grandchild is born. Also key? Consider how far in advance of sitting time the grandparent would like to be approached. If they prefer day-of requests be off-limits — except in case of emergency — tell the children that. In Kate’s case, there were two warning signs she missed. First, she was being asked to sit more and more frequently. Second, the extent of care she was being asked to provide for her grandson was expanding. Sure, sounds like a nice outing; but, is it something Kate should feel compelled to devote a big chunk of her time to making sure it happens? Things are different now. The new Grandma Kate weighs her decisions to babysit against the reason the baby’s parents require a sitter (what are their plans?). An important job interview gets a ‘yes’ much faster than a massage at the Y. The best solution is to handle the structure of childcare needs and family as professionally as possible and allow the grandparents to remain just that, rather than long term, short order babysitters that bend to the parent’s every beck and call. Just because it might be easier, doesn’t always mean its right. And a simple and heartfelt “thank you” – can let the grandparents know how much they are truly appreciated.